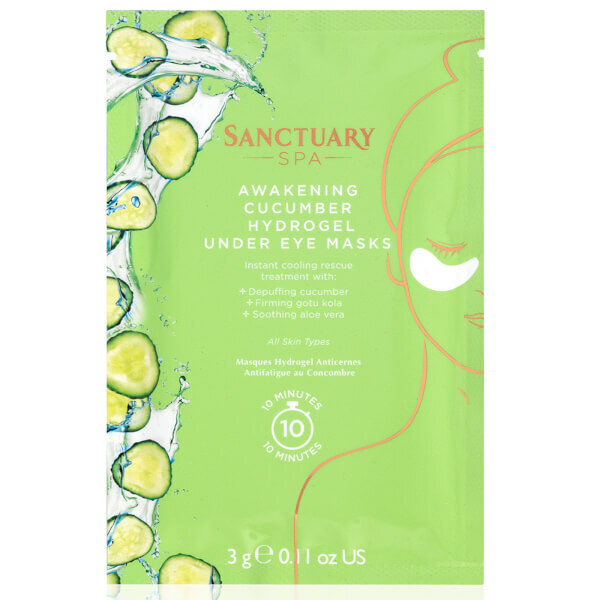 Revitalise tired eyes with the Sanctuary Spa Awakening Cucumber Hydrogel Under Eye Masks. 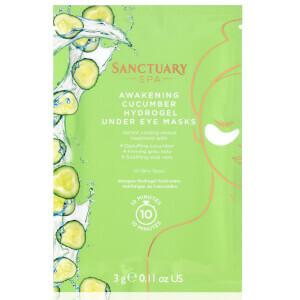 Infused with a host of beneficial ingredients, including Aloe Vera, Cucumber and Gotu Kola, the cooling treatment delivers soothing and firming properties to leave eyes looking fresh and bright in just 10 minutes. Ideal for all skin types. Remove the single use hydrogel patches from the backing material and gently place underneath the eyes. Remove the masks after 10 minutes and massage any remaining essence into skin. Water, Glycerin, Dipropylene Glycol, Caprylic/Capric Triglyceride, Ceratonia Siliqua Gum, Chondrus Crispus Powder, Glyceryl Stearate, Butylene Glycol, Paeonia Suffruticosa Root Extract, Centella Asiatica Extract, Cellulose Gum, 1,2-Hexanediol, Sodium Polyacrylate, Chamomilla Recutita (Matricaria) Flower Extract, Glyceryl Caprylate, Hydrogenated Polydecene, Polysorbate 20, Ethylhexylglycerin, Cucumis Sativus (Cucumber) Fruit Extract, Fragrance, Trideceth-6, Aloe Barbadensis Leaf Extract, Melaleuca Alternifolia (Tea Tree) Extract, Disodium EDTA.